Lisa Sampson is a self taught hula hoop artist who was inspired by taking her kids to a circus skills workshop in 2012. She made her debut performance at Circus Wonderland, a travelling big top circus in 2014 and loved it so much that she wanted more! She decided to brave a second time performance in 2015 in front of a Britains Got Talent audience of over 10 million viewers, gaining a standing ovation from the whole auditorium and 4 resounding 'yeses' from the judges Simon Cowell, Alicia Dixon, Amanda Holden and David Walliams. Lisa made it to the semi finals where for the first time she was daring enough to perform with fire! Lisa is a highly skilled, fun, daring and creative hula hoop artist and loves to perfect everything she does to the highest standard possible. 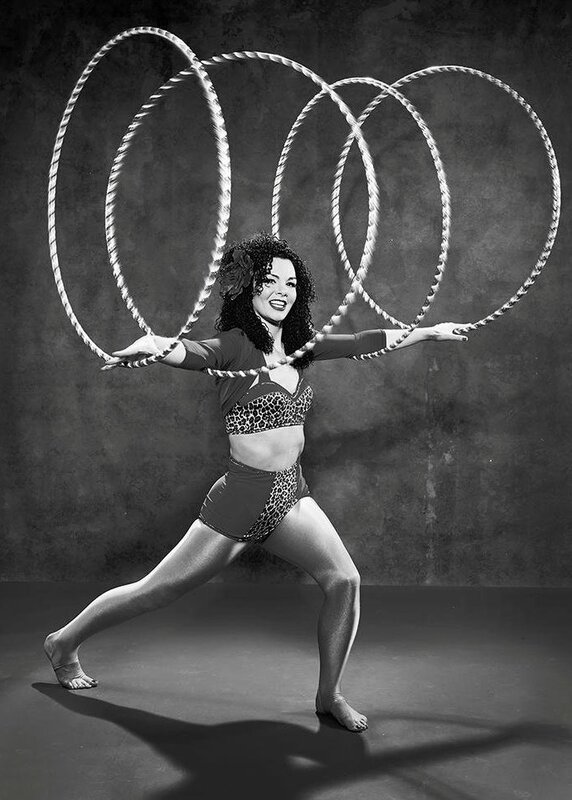 She can add fire and Smart Hoops (hoops with programmable light up patterns for a dazzling glow in the dark effect) into her routines, spinning 60 hula hoops as a grand finale before turning herself into a human slinky, which is a massive crowd pleaser!